About our Full camps and how they are created. As a company with 10 year experience we understand the seasons of the year & the swells that affect our different regions of Playa Jaco and other regions of the central and north pacific of Costa Rica allowing us to be able to determine what would be the best features for you to add to your camp based on the time frames of your possible visit and the tide charts for those dates as well as our suggestions, we would help create the perfect outline for you and a perfect training program weeks before your arrival.. The Full Camp format is our most complete and entertaining program, a perfect combination for the adventure lover, featuring one of the towns top activities per day as well as one surf lesson per day. On our area the tide would allow us to surf on two main blocks the two hours before the tide and the two hours during the tides, this would leave always a free block for us at Tortuga Surf camp to fill with extreme adventures and nature oriented tours in order to give you a taste of real Costa Rica. 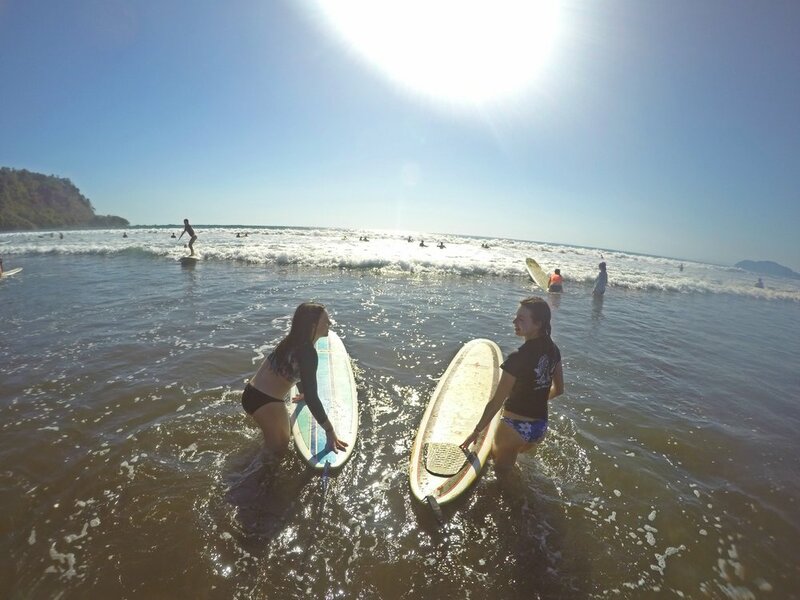 You would be able to choose from several options of lodging based on the amount of people on your party as well as you budget and preferences, we have lodging options for every type of student and we would help guiding you the right way to complete your perfect surf camp outline. Our surf camp representatives would be right on the other side of your computer ready to assist you 24/7 with thefastest email response time possible. 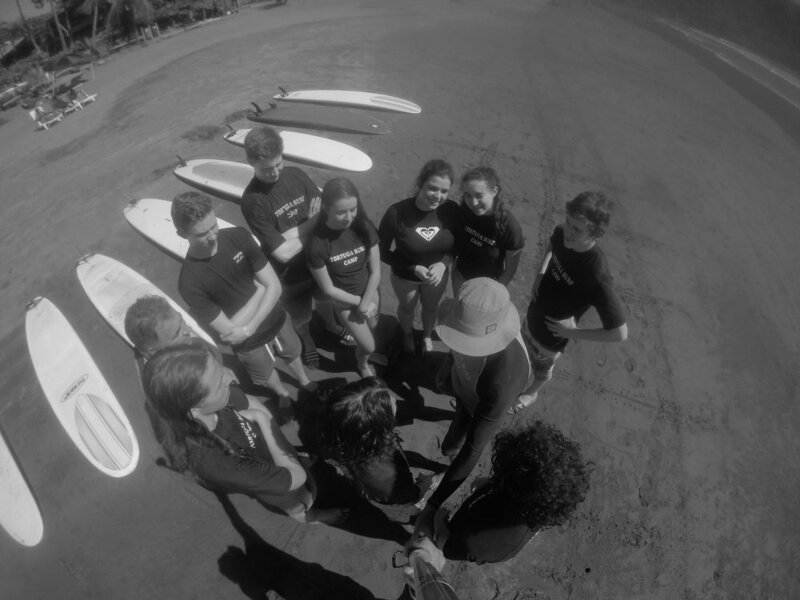 All full surf camp program would include features such as video review and core power work shops as well as hikes to local view point and off the beaten path secret spots too. We will help you find the best services and activities to do and see in town during your stay and take care of all the logistic for you, just so you can kick back and let the outline of your surf camp do the rest of the work. 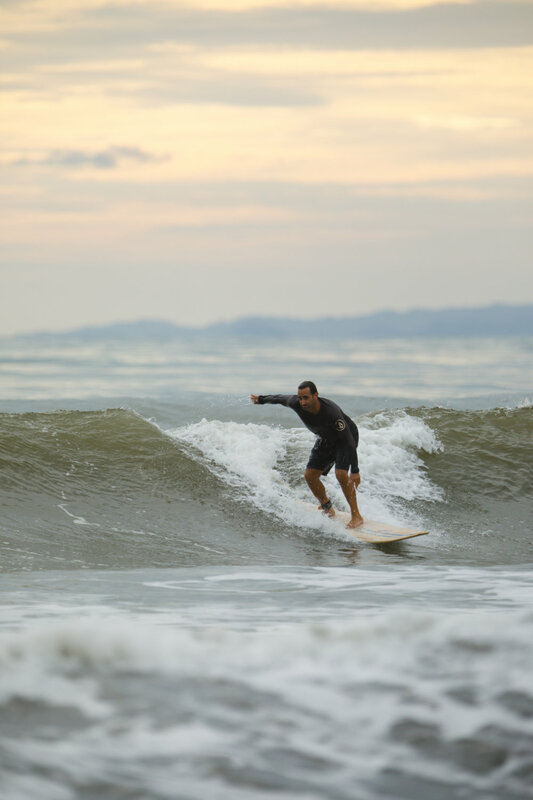 Don't spend half of your time trying to figure out what to do during your surf holidays and let us help you create the perfect itinerary for your Costa Rica surf holiday. Our main idea here at Tortuga is to create a camp that suits you adventure and training expectations all in one - by creating a camp that works with your vacation time availability. Just go through our dates for the upcoming 2019 seasons camps and find the week that works best for you. To create the initial idea of the program, we put together information we get from you (the student) into our pre set training week’s tide charts to make a general design for the program, so that it gives you a better idea about how our camps work. We call this the outline. Tortuga Surf School & Camps is a family-operated business with the intention of preserving and transmitting the original core of our country's water culture, combining its water knowledge with a local homelike feel . 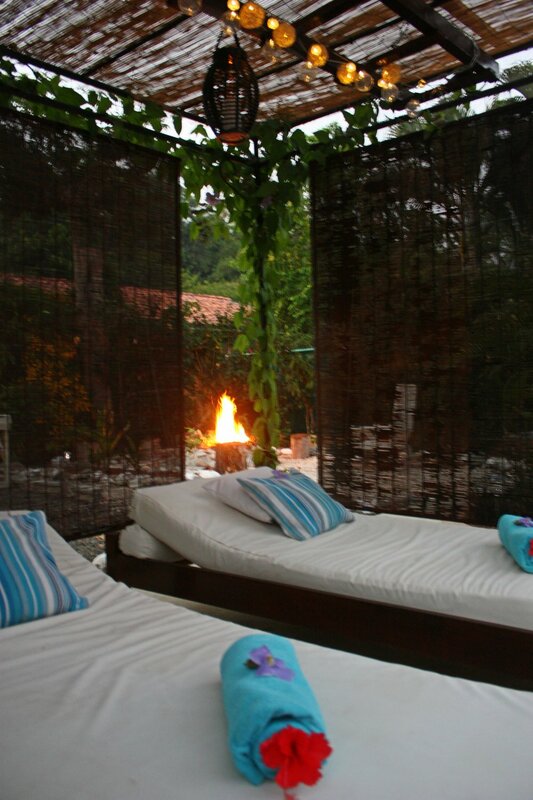 Our base camp is Hotel Perico Azul, a small hotel located at the south end of Jaco beach, on a nature-packed quiet street. The 15-year-old building is of classic Costa Rican horseshoe construction with a small pool in the middle - completely opposite of a huge resort, offering a great cozy feel to it. Allowing us to create small weekly groups for people to have a more familiar vibe yet still meet fun surfing partners of all levels along the way. Just a 10-minute walk to the town's center, and 5 minutes away from our beach station area, the hotel provides a nice and quiet setting with a perfect not-too-far, not-too-close location from Jaco's main strip and commercial area. Once we have determined what dates you would like, we will set up the program's outline. This will be your initial proposal for the camp for you to understand what a typical day would be. This is merely a formality to give you a mental image of how the camps work and what the relationship between the training schedules and the adventure activities looks like. Once again, this would just be an outline, as tides rule the clock, meaning this program would be subject to weather and water conditions. All cancellations or no shows to the already scheduled activities would result in the forfeit of the activity and its cost. If we need to reschedule due to weather or water conditions, there will be no charge for that portion of the camp. Check out our new Adventure tour & outdoor activity section! As a part of your time with us at Tortuga Surf camp we would help you complement your daily surf time with some outdoors activities and adventures to show you a little more of that wild side the country is famous for. 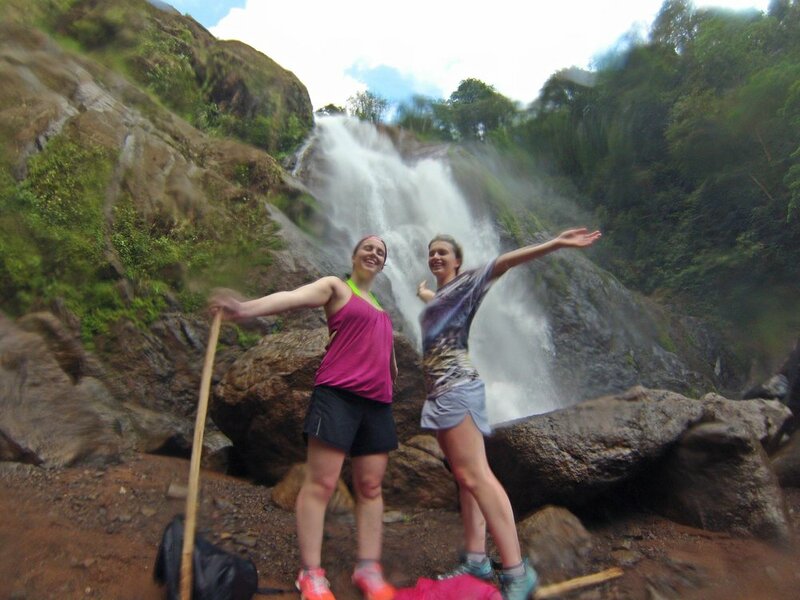 From Hiking near by to far away jungle adventures we would cover all aspect of Costa Rica in a safe educational way yet still filled with excitement and laughter. Our small country holds 5% of the worlds Biodiversity on its land and 33% of our territory is protected, two of its most known parks (Carara & Manuel Antonio) are located just drives away from Playa Jaco. 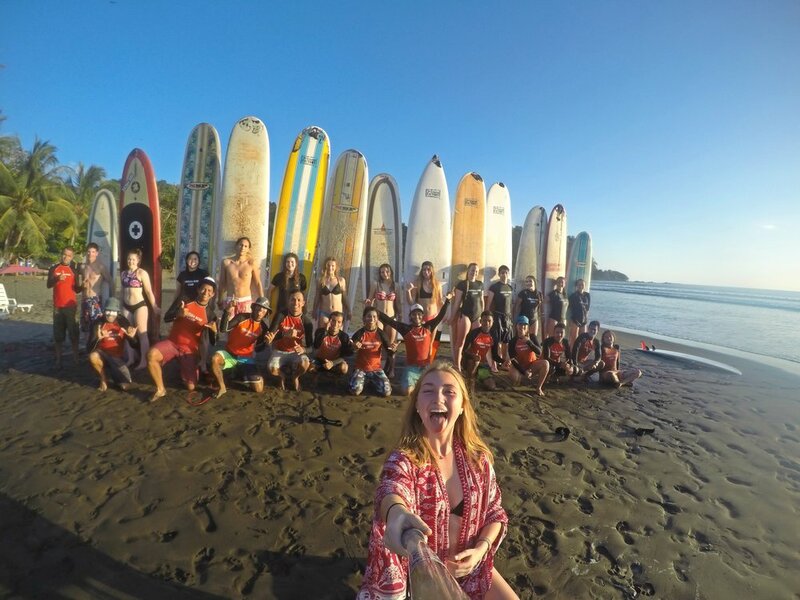 Check out our adventures tours section before submitting your reservation application and let us know what you would like to add to what would be one of your best memories for years to come, a surf camp in warm Costa Rica. Please keep in mind some of this activities are not compatible with some weather patterns during some of the periods of the year so the camp would add what we feel its best and safest towards the entire training group and send you an outline for you to approve before finalizing the reservation process. We created our own training program based on ISA (International Surfing Association) guidelines and our own personal and our group water-man and their combined knowledge. Our instructors come from all backgrounds and waves of the country, helping us to increase the detail of our programs and much more. The results now speak for themselves through the voices and reviews of our former campers and students on most online platforms. The long term (7-14-22 days) programs are all split into 3 main blocks. Of course, the shorter the program, the more intense the training would be. In this part of the program, we work on showing students how to properly move (if they are new students) and how to properly arrange your work tools (if they are intermediate and advanced levels). These programs are more intended to teach you how to train to improve. During this stage, we will overview your every detail related to movement, as well as the way your body should look while performing on the water - all of this being backed up and documented at all times by Tortuga Surf Camp instructors and beach staff. This way, you don't need to worry about losing a moment and it will keep your memory fresh. The timing stage is a “earn your rights to be there” type stage. Once the instructors feel like they can trust the students defensive moves and tools, they will proceed to take the student outside to the main lineup to start teaching how to ride green waves and side lines. With the help of our instructors, the timing’s "umbilical cord" can be completely detached from the student, allowing them to experience a little more independence on the water. All of this still keeps a one-to-one instructor/student ratio so that we can keep things safe and show our students how water formations work with the instructors. This way, students learn how water etiquette works when out surfing on your own - also a very important topic for the traveling surfer-to-be. Navigation is extremely important for a surfer's safety, so we dedicate an entire block to navigation and media exposures. This way a student can understand how to be in one area to make your time out surfing more efficient. This block also helps give you principals on surf forecasting so you are able to plan and predict your next surfing vacation (according to beaches similar to the ones we will be using to train) and to show you the mechanics of a beach and its navigational importance. Check out our new lodging features ! 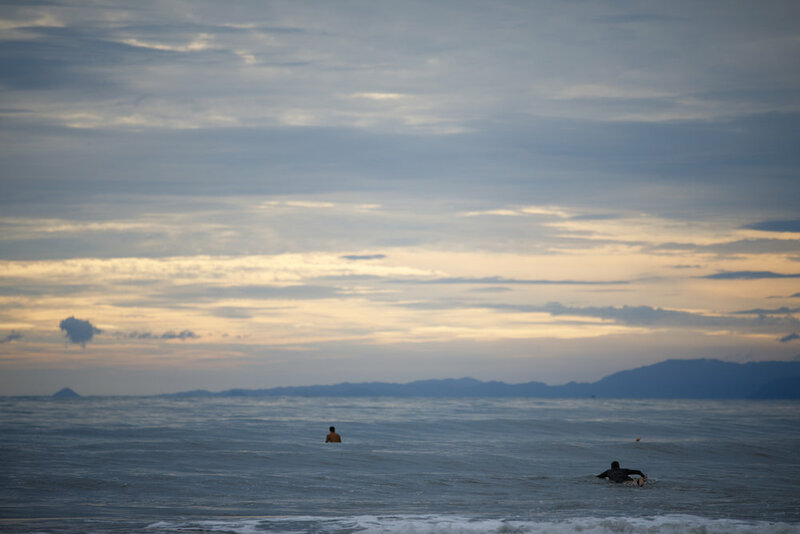 With a whole new list of options you can now select the perfect location and lodging type for you and your loved ones, let us take care of all the minor details and logistics so that you can just enjoy your surf time on Playa Jaco, Costa Rica. Once we have determined your time frame in the country we would check on our end to help you determine the best available space and create the an outline for you to have an idea of what the day to day would be like during your training period with us at Tortuga Surf camp, Playa Jaco Costa Rica. -Round trip private airport transfers AC & WIFI available. -Professional photography sessions for technical reviews.